What: Elin Hilderbrand will discuss and sign her new book, The Rumor. When: Tuesday, June 23, 7:00 pm Where: Blue Willow Bookshop, 14532 Memorial Drive, Houston, TX 77079 Admission: In order to go through the signing line and meet Elin Hilderbrand for book personalization, please purchase The Rumor from Blue Willow Bookshop. At the time of your purchase, we will issue a signing line ticket that indicates your place in line. Your book and signing line ticket can be picked up at the event. About the Author: Elin Hilderbrand is the author of "The Island", "Nantucket Nights", "Summer People" and "The Blue Bistro", among others. She grew up in Collegeville, Pennsylvania, and is a graduate of the Johns Hopkins University and the University of Iowa Writers' Workshop, where she was a teaching/writing fellow. Her short fiction has appeared in "Seventeen", "The Massachusetts Review", and "The Colorado Review". She lives with her husband, Chip Cunningham, and their two sons in Nantucket, Massachusetts. Book: Nantucket writer Madeline King couldn't have picked a worse time to have writer's block. Her deadline is looming, her bills are piling up, and inspiration is in short supply. Madeline's best friend Grace, is hard at work transforming her garden into the envy of the island with the help of a ruggedly handsome landscape architect. Before she realizes it, Grace is on the verge of a decision that will irrevocably change her life. Could Grace's crisis be Madeline's salvation? As the gossip escalates, and the summer's explosive events come to a head, Grace and Madeline try desperately to set the record straight--but the truth might be even worse than rumor has it. Ordering: A limited number of autographed copies of this book will be available for purchase after the event. If you cannot attend the event, and would like a personalized copy of the book, please call us before the event at (281) 497-8675. If you can't attend the event or need a copy shipped to you, you may call the store or add the appropriate book to your cart on our website. Payment type must be "CreditCard." In the order notes, add personalization details. To place an international order, please email orders@bluewillowbookshop.com to obtain shipping details and to have items shipped to you. Staff will respond within 24-48 hours. AUTHOR EVENT: Elin Hilderbrand - "The Matchmaker"
The Matchmaker is a touching new novel from bestselling author Elin Hilderbrand in which a woman sets out to find love for those closest to her - before it's too late. In the book, 48-year-old Nantucketer Dabney Kimball Beech has always had a gift for matchmaking. Some call her ability mystical, while others - like her husband, celebrated economist John Boxmiller Beech, and her daughter, Agnes, who is clearly engaged to the wrong man - call it meddlesome, but there's no arguing with her results: With 42 happy couples to her credit and all of them still together, Dabney has never been wrong about romance. Elin Hilderbrand spent her summers on Cape Cod, "playing touch football at low tide, collecting sea glass, digging pools for hermit crabs, swimming out to the wooden raft off shore," until her father died in a plane crash when she was sixteen. She spent the next summer working, doing piecework in a factory that made Halloween costumes; she promised herself that the goal for the rest of her life would be that she would always have a real summer. She moved to Nantucket in July of 1993, took a job as "the classified ads girl" at a local paper, and later started writing. Hilderbrand's novels have all been set on and around Nantucket Island where she still lives with her husband and three children. She is a graduate of Johns Hopkins University and was previously a teaching/writing fellow at the University of Iowa Writers' Workshop. Hildebrand's bestselling titles include Beautiful Day, The Surfing Lesson, Summerland & Silver Girl. 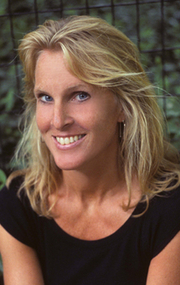 Elin Hilderbrand - "Beautiful Day"
New York Times best selling author Elin Hilderbrand will discuss and sign her novel Beautiful Day on Wednesday, April 23nd at 7:30pm. Reserved Seating is available. Please contact the Warwick's Book Dept. at (858) 454-0347 to purchase. The Carmichaels and the Grahams have gathered on Nantucket for the summer wedding that will unite their families and bring the culmination of hopes, dreams and romantic dreams. The bride's late mother left behind The Notebook -- specific instructions for every detail for the perfect day for her youngest daughter's nuptials. But things fall apart, scandals arise, plans falter, and hearts are broken and healed. Elin Hilderbrand reads from Silver Girl. Elin Hilderbrand , A Summer Affair. Elin Hilderbrand's book Winter Street was available from LibraryThing Early Reviewers. Elin Hilderbrand's book The Matchmaker was available from LibraryThing Early Reviewers. Elin Hilderbrand is currently considered a "single author." If one or more works are by a distinct, homonymous authors, go ahead and split the author. Elin Hilderbrand is composed of 3 names. You can examine and separate out names.